I thought an instagram catchup was in order seeing as i've been posting rather a lot over there and not on here! I must say my life isn't overly interesting as i've mainly been visiting my boyfriend and working on my lingerie/clothing line, but hey, heres whats been going on with me. 1// An & Other Stories haul from my trip to london. Great shop, wish we had it here! 2// My new Sunflower Shorts from Asos which are actually pretty difficult to style. 3// Lola's cupcakes. Amazing but very expensive - this teeny tiny was about £1.50! 5// In love with Nars 'Schiap' Lipstick. The perfect bright pink! 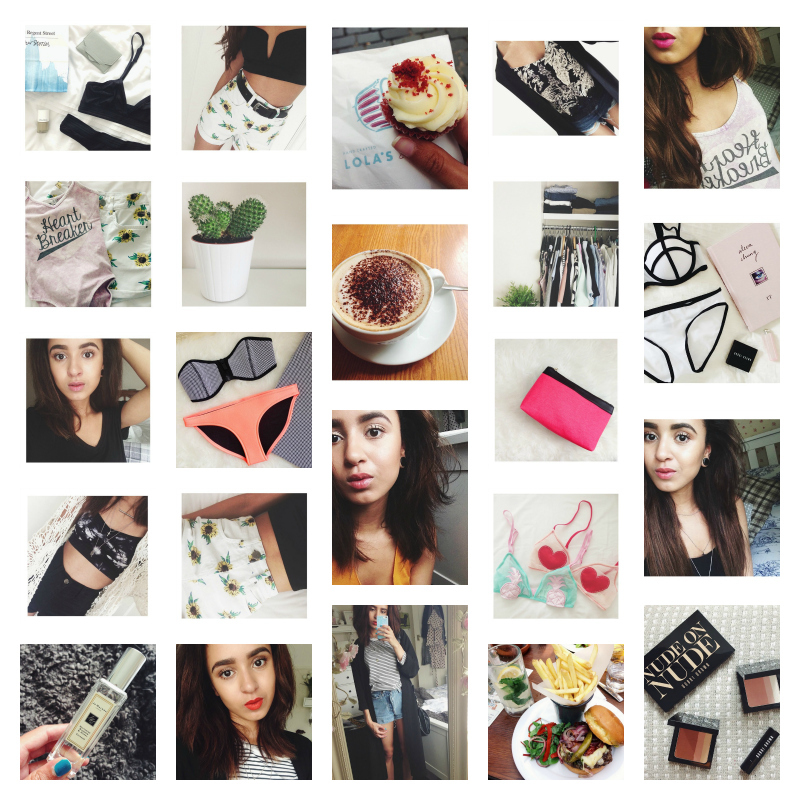 6// An Asos haul featuring a lovely yet untrue leotard and those printed shorts. 7// Loving this little cactus guy. Too cute. 8// Surviving on Cappuccinos at the moment. 9// A wardrobe clear-out happened. I posted about it here. 10// Daily essentials - Good undies and pretty makeup is a must. 12// My beautiful new Triangl Bikini, in love! Now i need to go on holiday! 13// Whistles sale was very good. Picked up this beauty of a makeup bag, perfect timing before visiting my boyfriend. 14// A look from my summer lookbook which you can watch here! 15// Cute topshop undies. Can you tell i have a thing for cute underwear? 16// Jo Malone Nectarine Blosson & Honey is my current favourite sent. lovely jubbly. 17// AMAZING Burger and mint lemonade. Need to go back ASAP. 18// Numerous Bobbi Brown Purchases for me and the Mother. A Base Combination Perfect for Summer.